Animation can be used to tell us stories and show us worlds where only imagination is the limiting factor. In these stories, shapes and colours come to life, transporting us to somewhere new. 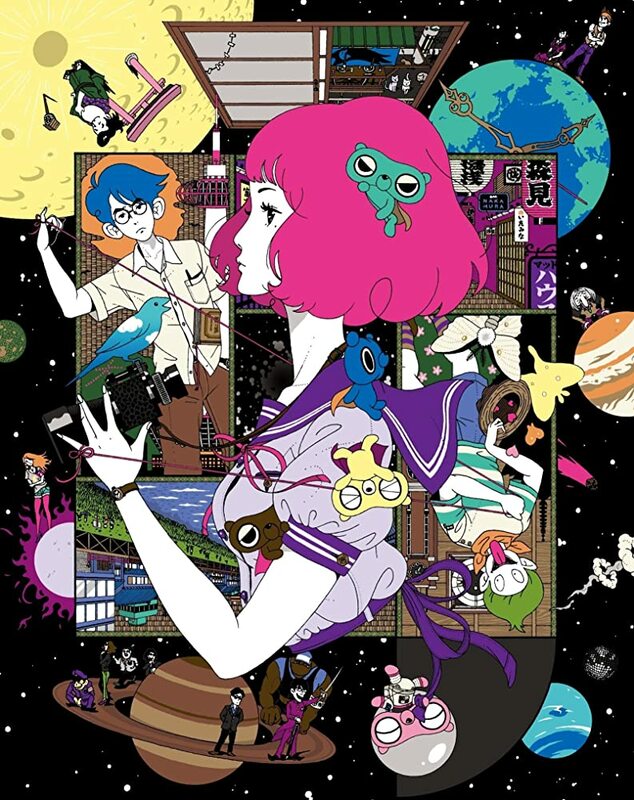 When the wild and free style of Masaaki Yuasa is combined with the animation studio Madhouse and, what is considered to be the wild and free time of the student life at university, we get Tatami Galaxy, the anime. The Tatami Galaxy is an anime based on a book written by Tomihiko Morimi that was published in 2004. 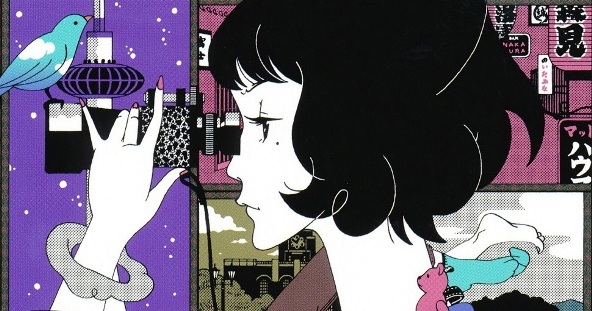 It is very difficult to know where to begin when describing the story of The Tatami Galaxy. At its core it is the tale of an un-named university under-graduate and his experiences at a university in Kyoto. He is looking to have the perfect time and meet a raven-haired maiden. That's about all we know. All of this is told from his point of view accompanied by an internal monologue that goes at a pace similar to a machine gun. During these adventures we meet Ozu, a strange character who seems to live off the chaos he sets in motion; Akashi who is a raven-haired engineering student one year below our narrator; Higuchi and enigmatic philosopher-like person living in the same building as our narrator; Jōgasaki who is the president of the film club who has perfect teeth; Hanuki who is a dental hygienist who sometimes gets carried away when she drinks; and finally Kaori another raven-haired maiden. 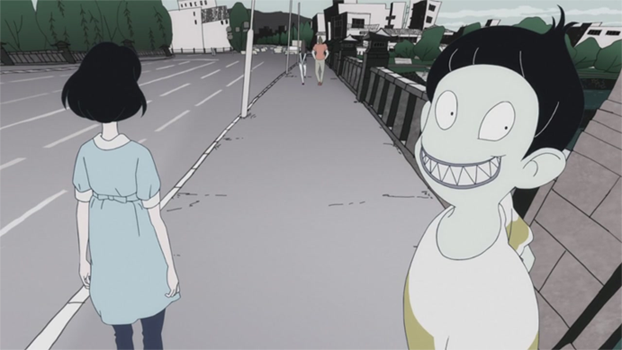 Six years after the book was published the story was adapted into an anime directed by Masaaki Yuasa. Over the years I have heard people talk about Yuasa's work and to this date was not aware of watching anything that he had been involved with. After seeing this (and looking online) I discovered he was involved with Space Dandy, My Neighbours the Yamada's and also Samurai Champloo, all of which I *really* enjoyed. I have often heard that he is visually inventive and is a fresh, innovative creator. I would say that is true and then some. It is difficult to split the story and the visual/animation aspects in Tatami Galaxy as both aspects are closely coupled. It is a show that uses imagery to tell the story as much as what is being said or acted out does. With regards to the story, the less you know about it, the better it is an experience. The story is good, *really* good, and what begins as a "what the ...?" comes together in a neat and complete package with no messy threads left. What starts initially as a chaotic story, a bit like a tangled ball of wool, weaves itself into beautiful tapestry, with logical flow and a real heart. At times I felt like I was one step ahead of the main character in his here and now within the episode, but in the wider world within which this is set you are as clueless as him. As such you experience the reveals and twists with him, but are stood slightly apart to give you a sense of perspective on events. Where this series shines is in its visually dynamic and original-looking world. It is a skilful mix of 2D animation and sequences where 2D animation has been overlaid on to real-world video imagery (we first see this in the opening sequence). This gives those scenes a different sense of energy and feels completely consistent with the world Yuasa and the team at Madhouse have created. As you would (and should expect) the Madhouse animation is fluid and always pleasing on the eye. Colours are used to great effect (a favourite being one rendered in black and red suggesting a sense of mortal or moral peril). You can also see above a shot from a night out drinking and get a good indication as to how they are all holding up. Each episode has a different feel, in part to its colours going from gaudy poster-colours to softer pastels, but completely fitting the tone of the episode. All of the main characters are all fun to look at and, even with limited time with them they feel fleshed out and like real people with foibles, issues and all their imperfections. There is an abstracted, realistic, and naturalistic quality to them. I like strong (or thick) lines but the character designs here have a much more delicate outline which I found appealing. This line-style was coupled with bold colours that filled the shapes, or bold patterns (which at times reminded me of Gankutsuo and the way it applied texture to shapes). My favourite character to look at was Akashi - she looked so elegant and ... normal. A stark contrast from women in other shows. Ozu was a lot of fun to look at too - sort of half-man half lizard. In addition to blending 2D animation and real-world footage the character design-work reminded me of the Ukiyo-e art movement, particularly our narrator, Ozu and Higuchi (who is always seen in his yukata). It also seemed to draw an influence from the Superflat art movement (which itself was influenced by anime and manga). Perhaps this is most evident in the character designs - with flood-filling and no shading there is the sense that they are flat planes, but we know what the perspective should be. There seemed to be other references to the Pop Art movement and the works of Andy Warhol. For me this came (again) from the use of vivid colours and the simple outlines, or the repetition of an image (like the night out shot above). This makes Tatami Galaxy something to behold. Occasionally all of the colour and shape can be a bit overwhelming but that was a bit what university life was like at times. Each character has a set of personality traits that are developed at the series progresses which are used to comedic effect at times, especially Ozu and his ability to make mischief, but also give you a sense of who they are. There is just enough that you can try and guess the blanks and then those blanks are filled in as the story progresses. The story plays out over 11 episodes so it never outstays its welcome and, for me anyway. was the perfect length for the tale. Each episode was around 20 minutes long and the pace was spot on. Not once did it drag or feel laboured. Because this is a show with young adults as its principal cast the content is more mature than typical high-school based anime and it is able to take more risks (with its look and how the stories play out). One of its more mature topics is the awakening of our narrator's desires toward the women in his life. This is depicted by Johnny, a cowboy who neatly expresses the unspoken thoughts of our narrator. He is a visual treat, a 2D representation of a 3D-animated marionette. It handles this awakening with care and just the right amount of comedy. Along with this, we have the ideas that the perfect life doesn't exist and that friendship can come from anywhere. I loved The Tatami Galaxy. I was not expecting to enjoy it as much as I did. From its opening funky rock theme tune to it angular trance-like electro-pop ending I sat watching this show, a bit confused but always entertained. It has some real laugh-out-loud moments, moments that are more considered or touching and sequences that celebrate the joy of life and friends. The screen throughout is a kaleidoscope of colours and shapes that creates both an inventive and familiar world to the viewer. On the strength of this I would seek the other works of Yuasa and give them a go without question. Tatami Galaxy is the first show in a long while that I have wanted to recommend to everyone I know and I can't wait to see it again. The Tatami Galaxy is available as a collector's edition on Blu-Ray from Anime Ltd in the UK.